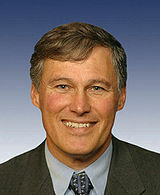 Former Congressman Jay Inslee is the co-author, together with Bracken Hendricks, of Appollo's Fire: Igniting America's Clean Energy Economy (2007). Inslee and Hendricks present the argument that improved federal policies could make the U.S. less dependent on fossil fuel, reduce global warming, and benefit the economy by creating green-collar jobs. Actor Robert Redford says of the book: "For those of you who want to move beyond the doom and gloom of the global warming dialogue, Apollo's Fire fits the bill. Set in a frame of optimism and urgency, this book thinks big and shows that innovation, curiosity, and imagination already are driving the beginnings of an Apollo-like leap toward necessary solutions. The authors' sweeping and attainable vision for America's energy independence shows we can once again reach for higher goals and succeed."